A cloned pupper might make you feel that 'Happy Days Are Here Again.' Or maybe not. On February 27, a Variety cover story broke the most newsworthy animal cloning story since Dolly the sheep. 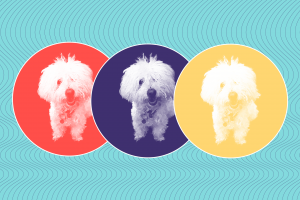 Before Samantha, Barbra Streisand’s well-loved Coton de Tuléar, passed away in 2017 at the age of 14, her owner had her cloned—not once, but twice. Cells from the dog’s mouth and stomach were used to create the two clones, which are called Miss Scarlett and Miss Violet. If you’re thinking about following Streisand’s example and are dead-set on bringing Fido back to life, here are a few things you should know. Streisand didn’t reveal which company she entrusted with cloning her pet, but the options currently available are rather expensive. A South Korean lab called Sooam Biotech has reportedly carried out the procedure over 600 times, and charges $100,000 per attempt, while the Texas-based ViaGen Pets asks for a more reasonable $50,000 each time, according to a report from the New York Times. That price tag is even more distressing when you learn that making a genetic copy of your pup is far from a guarantee. Sooam Biotech estimates that its cloning process works about a third of the time, per NPR. Other dogs are used as surrogates, and provide eggs, and their welfare has to be taken into account when we consider the ethics of cloning – is it really fine to have a dog miscarry unnecessarily? Our genes do not dictate who we are. Identical twins can sometimes act, or even look, pretty different. The same is true for cloned dogs. Pet cloning company My Friend Again writes on the FAQ on its web site: “If the new clone grows up in the same environment as the original dog than the personality will be the same or closely similar.” Closely similar. Still thinking of cloning your dog? It’s best to plan ahead. If your dog is still alive, you can take it to the vet to get the biopsy sample required for cloning – an eight-millimeter piece of skin from its abdomen, according to Business Insider. If it’s already passed away, you’re not completely out of luck, but you’ll need to wrap its body in wet towels and keep it in the refrigerator until you can take it to a vet and get those samples. Not exactly letting Fido rest in peace. By bringing another animal into the world, you might be leaving one more to die. Every year, around 1.5 million shelter animals are euthanized in the U.S. alone because nobody wants them. Also, it’s way cheaper to adopt from a shelter, or even from a breeder, than to clone the family canine.